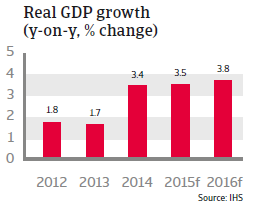 The Polish economy is expected to benefit from low energy prices and the rebound in the Eurozone, with GDP expected to grow 3.5% in 2015, based on robust domestic demand and increasing exports. The current political situation is stable. A coalition between the Christian-democratic Civic Platform (PO) and the agrarian, farmer-oriented Polish People´s Party (PSL) has been in power since the October 2011 general elections, with a slight parliamentary majority. The next parliamentary election is due to be held 25 October 2015. Currently, the conservative Law and Justice party PiS is leading the polls. In the May 2015 presidential elections the PiS candidate, Andrzej Duda, won against the incumbent Bronislaw Komorowski from PO. In recent years, Poland’s economy grew at a substantially faster rate than the Eurozone, and is expected to do so in the coming two years. 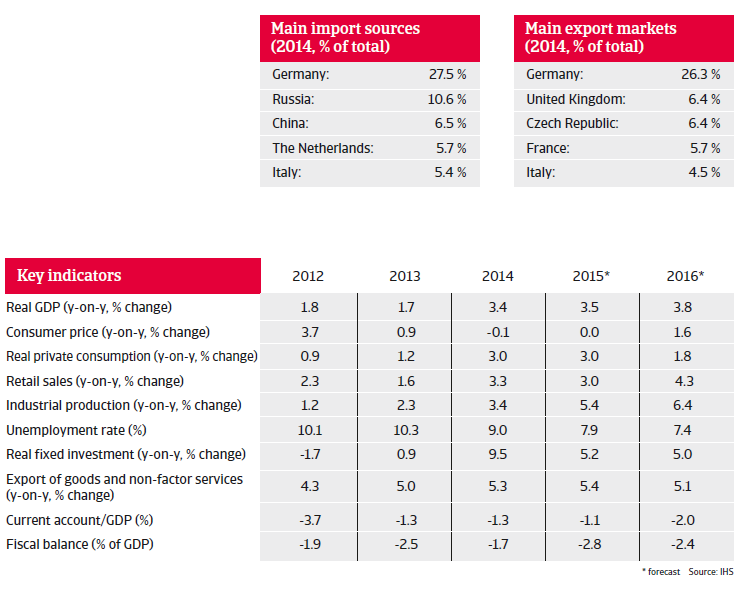 In 2014 Polish GDP increased 3.4%, mainly driven by private consumption and investment. The agriculture and food sectors have been particularly hit by Russia’s embargo on EU food imports, as before the ban Poland annually exported fruit and vegetables worth between USD 1-2 billion to Russia. That said, the Polish economy is expected to benefit from low energy prices and the rebound in the Eurozone, with GDP expected to grow 3.5% in 2015, based on robust domestic demand and increasing exports. In 2016 the economy is expected to grow 3.8%. Since 2013, consumer price inflation has been low, below the National Bank of Poland (the Central Bank) target of 2.5%, and even turned negative since July 2014. Deflation is driven by the domestic impact of the plunge in oil prices and Russia’s ban on food imports, which has created excess supply of food products domestically. This has led the National Bank of Poland to lower the benchmark interest rate to 1.5%. 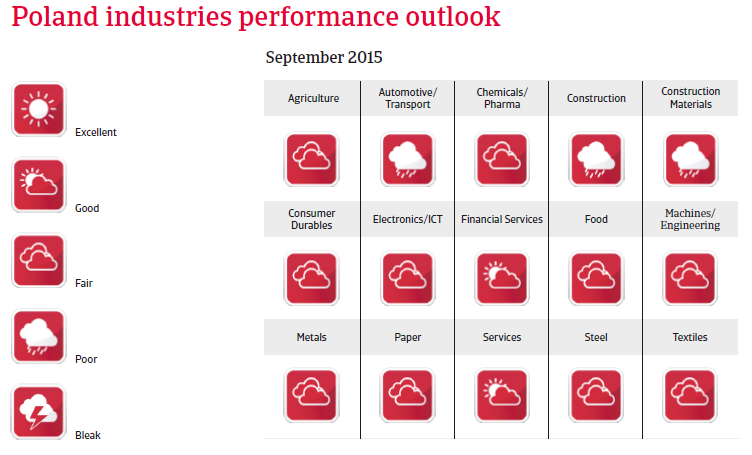 Consumer prices are expected to remain unchanged in 2015 and to increase 1.6% in 2016. 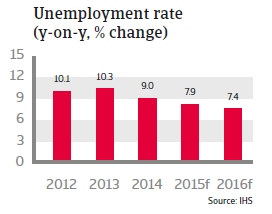 The unemployment rate, although below the Eurozone average, remained high in 2014, at 9.0%. That said, a labour office reform and new forms of aid for employment purposes, implemented in May 2014, led to a decrease compared to 2013 (10.3%). Demand for new jobs is growing and is highest in the industrial production and the education segments. Unemployment is expected to decrease further, to 7.9% in 2015. Since 2007, Poland’s government debt has increased, and in 2013 it peaked at 57% of GDP. But it decreased to 50.1% of GDP in 2014, primarily due to a pension reform (which however is only a short-term solution to reduce government debt). The fiscal deficit has been below the 3% Maastricht threshold since 2009 and is forecast to remain so in 2015 and 2016, but is expected to increase in 2015, as military spending is likely to be increased further as a reaction to Russia’s intervention in Ukraine. Poland´s foreign debt level increased from 42% of GDP in 2004 to more than 70% in 2014. While this is a very high level, it is still in line with most Central and Eastern European countries. 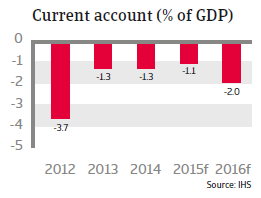 The current account deficit has returned to a more moderate level of 1.4% of GDP in 2013 and 1.3% of GDP in 2014. This decrease has been mainly due to exports outperforming imports. The current account deficit is expected to decrease to 1.1% of GDP in 2015, but to increase again in 2016 (to 2% of GDP) due to higher domestic demand boosting imports. During the 2008/2009 credit crisis, the Polish currency depreciated sharply against the euro. However, since then the exchange rate has been relatively stable, and there is currently no reason to expect any major currency fluctuation. Overall, Poland enjoys solid investment grade ratings and the government can borrow at reasonably good rates on the financial markets. Yields have been decreasing due to strong foreign demand for Polish external debt and monetary loosening by the European Central Bank (ECB). Poland has robust economic fundamentals that should protect it in case of adverse investor sentiment. A rebound driven by construction recovery, but increased foreign competition affects businesses´ margins.